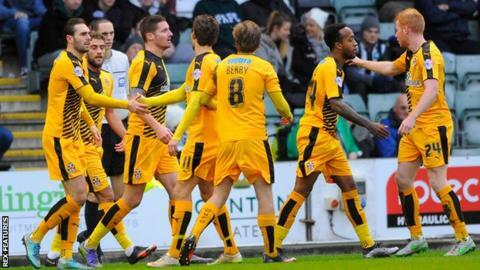 Cambridge United boss Shaun Derry says his current squad is too large as the January transfer window approaches. The U's have won three and lost three of their six matches since 38-year-old Derry replaced Richard Money at the League Two club. "It's tough when you walk into a football club and it's got 28 or 29 players and, with the greatest respect, we're in League Two," said Derry. "They're numbers that cause some difficulties and are too much for me." He continued to BBC Radio Cambridgeshire: "Unfortunately there's going to be some unhappy lads. "But they have to be professional as well, they can't throw their dummy out; it's a long season and I'm going to be needing a number of them between now and then." The U's currently have six players on loan at the Abbey Stadium, including Everton midfielder Ryan Ledson, Gillingham striker Ben Williamson and Shrewsbury defender Mickey Demetriou. Derry confirmed that discussions were under way with parent clubs about the players they want to keep on. "I think the loans have done well for us," said Derry. "They've given us a different aspect to what I walked into and created that intensity that I've been looking for. "There'll be a number of loans that I'll want to keep and there'll be one or two who you shuffle about, but I suppose that's the advantage of playing in the loan market. "I have said that isn't something I want to be our bench mark in terms of our strength coming from our loan players - I want it to be our side and I think I'm getting closer to that."